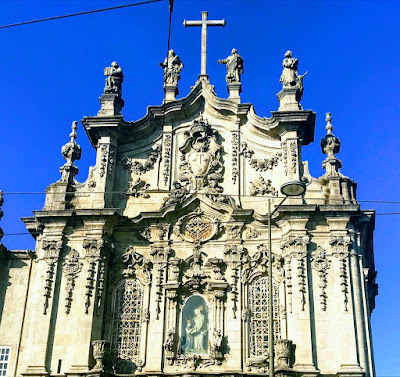 At every turn, on every corner, and on every hill top in Porto this week, it seemed there was yet another beautiful baroque church, with walls covered in typical blue-and-white Portuguese azulejo tiles, and stories to tell about Portuguese architecture and church history. The first church I visited this week was Porto’s Se or Cathedral. But in the days that followed, I visited many more churches in Portugal’s second city. 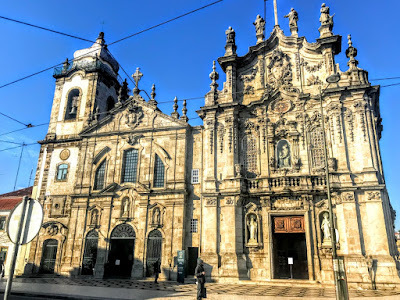 At the Carmelite site on the corner of Praça de Carlos Alberto and Rua do Carmo in the heart of the city, I found not one but two churches, with three separate buildings on the site, although at first glance they seem to form just one composition. Although the Carmo Church and the Carmelite Church stand as two separate churches, they form what appears to be one single building. The Igreja dos Carmelitas or Carmelite Church is the earlier of the two churches. It was built in the 17th century for the Carmelite order of nuns. The exterior was completed in 1628. However, the interior decoration was not completed until 1650. The convent no longer exists and is now occupied by the Republican National Guard. The façade of granite stonework has three arched entrances with arches, surmounted by three niches with images of Saint Joseph, Saint Teresa of Avila and Our Lady of Mount Carmel. Above are three windows and at the top of the façade a triangular pediment is surmounted by balusters. The bell tower to the left is lined with blue and white azulejos tiles and topped with a dome. Inside, the Church of the Carmelites is in the shape of a Latin cross, with a single nave, six ornately decorated side chapels and a narthex at the entrance. 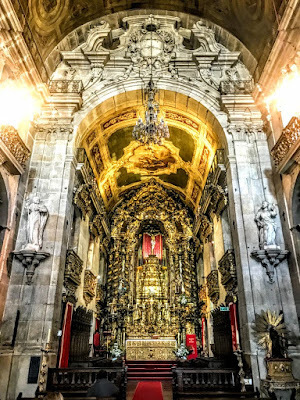 The main altar and the side chapels have excellent gilded carving in the baroque and rococo styles. The main altarpiece was designed by Joaquim Teixeira de Guimarães and executed by José Teixeira Guimarães. The white ceiling and large windows add a lightness to the interior. The organ was restored recently thanks to contributions from the general public. The Igreja do Carmo or Carmo Church was built beside the earlier church in the 18th century for the men of the Carmelite Third Order. Third orders extended to lay members the same spiritual privileges of the first and second male and female orders. 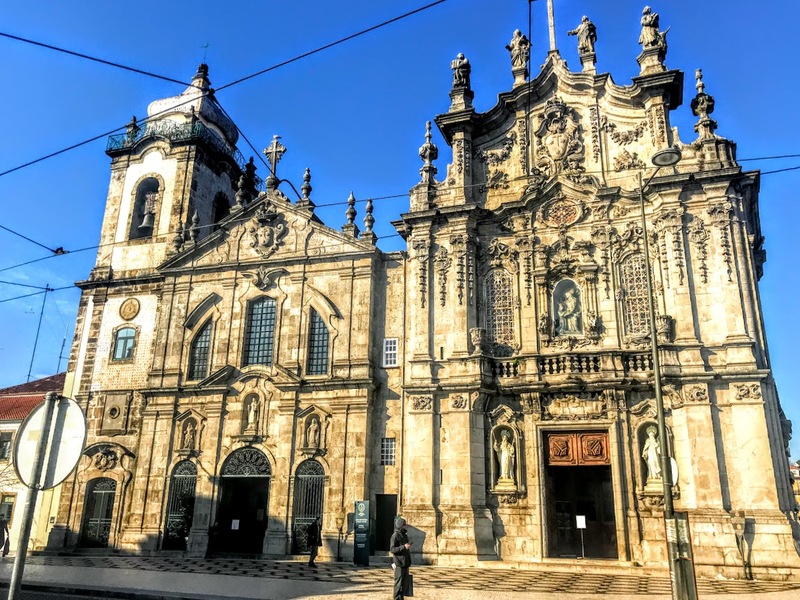 The Third Order of Our Lady of Carmo in Porto was founded in 1736. 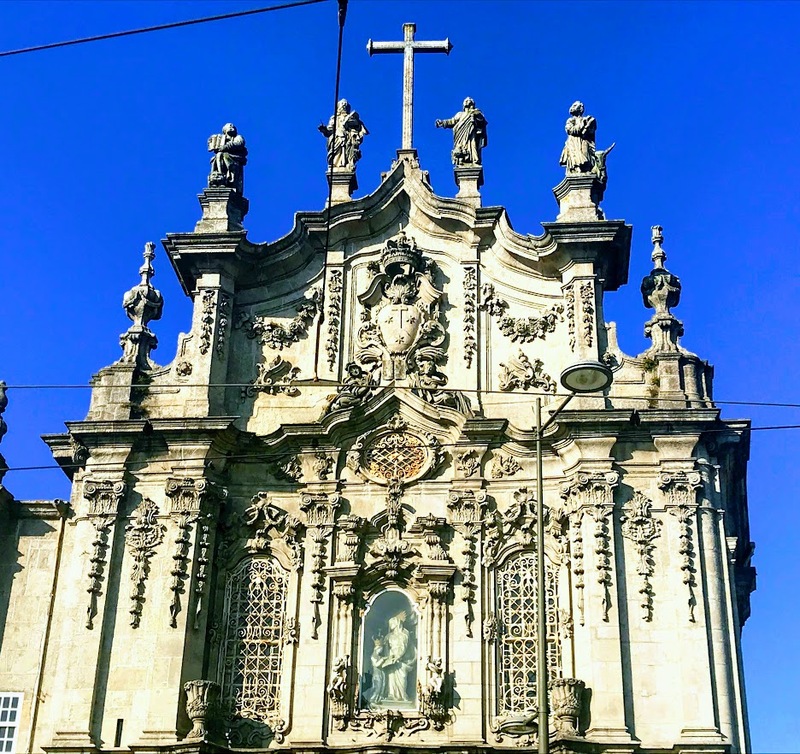 The Igreja do Carmo was built between 1756 and 1768 in the rococo or late baroque style by Jose de Figueiredo Seixas, a student of Nicolau Nasoni. The church is dedicated to Saint Anne (26 July), mother of the Virgin Mary, and opened on 24 July 1768. Architecturally speaking, this is probably the more eye-catching building, built in the baroque style, with the exterior side walls decorated with azulejo ceramic tiles of white and blue. The façade is richly crafted with a rectangular portal, flanked by sculptures of the prophets Elijah and Elisha carved in Italy. It was said that Saint Anne had appeared to the first group of Carmelites, while the prophets Elijah and Elisha are associated with Mount Carmel. In the upper part of the façade, there are figures of the four evangelists. The side of the Igreja do Carmo is lined with a large panel of azulejos or blue and white tiles presenting scenes in the story of the foundation of the Carmelite Order and Mount Carmel. The composition was designed by the artist Silvestre Silvestri and painted by Carlos Branco. The tiles were made locally in the factories of Senhor do Além and Torrinha, in Vila Nova de Gaia in 1912. 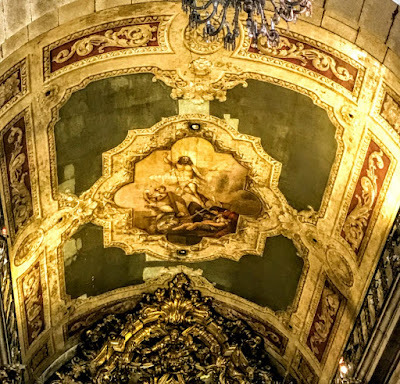 Inside, the church has a single nave with seven lavish gilt altars, the work of the sculptor Francisco Pereira Campanha, as well as many statues and several oil paintings, including a painting of the Resurrection on the vault. Both churches are extravagant sights to behold, making it easy to completely miss the small, narrow house that separates them. The house is no more than one meter in width and it is said to have been built here to make sure there were no communications between the nuns of the Carmelite Church and the men in the Carmo Church. Another explanation says there was an unwritten law stated that no two churches should share a common wall. Yet another story claims two archbishops could not get along with each other, so one built a church next door to the other in the ultimate architectural spite move. People actually lived within this narrow house and it was inhabited until the 1980s. 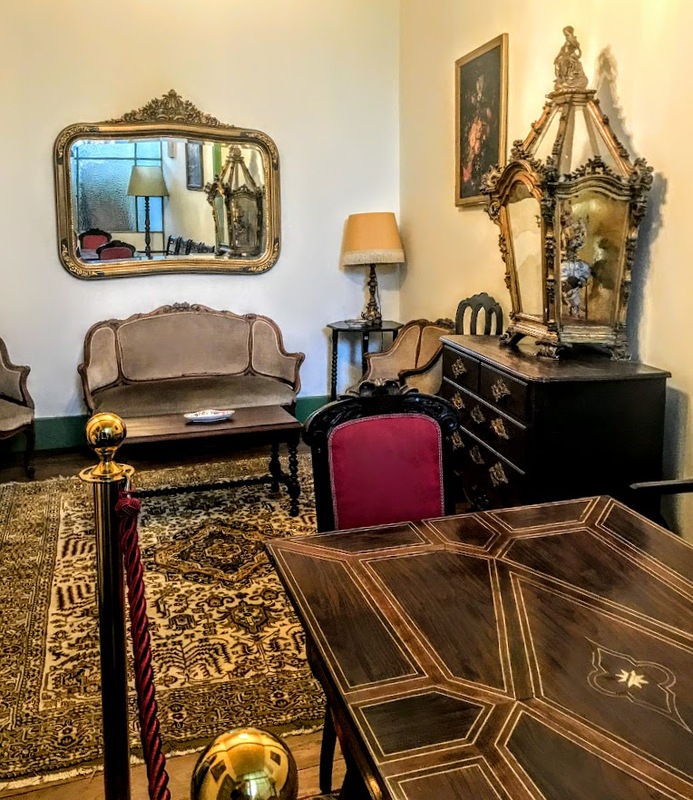 It has been used for chaplains, artists and resident priests, but was also used for secret meetings during times of political upheaval, and more recently was the resident of the church sacristans. The two churches and the tiny, narrow ‘hidden house’ were classified together as a National Monument in 2013.